For the first time in 12 months the Clarets failed to win a game in which they'd taken the lead as they drew 1-1 against Carlos Carvalhal's Sheffield Wednesday at Hillsborough. Since surrendering the lead against West Brom at Turf Moor in the Premier League, Sean Dyche's side had won all 17 outings where they had scored first. But it wasn't to be on this occasion as Kieran Lee wiped out Andre Gray's earlier opener. Gray probably won't be gifted an easier tap in for the rest of his career, firing past Keiren Westwood from inside the six yard box after being picked out by Sam Vokes's low cross from the right hand side of the penalty area. The home side's response to conceding early on wasn't ideal as Atdhe Nuhiu's ambitious volley comically swerved out of play for a throw in. Former Claret Ross Wallace went closer midway through the half but his right footed drive failed to trouble Tom Heaton at his near post. 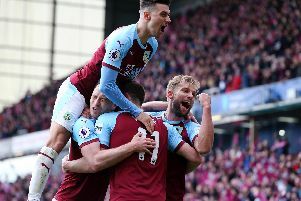 After half-an-hour of the fixture had elapsed, Scott Arfield pulled away from his marker but lifted his effort over the bar once George Boyd had broken free down the left flank. Wednesday became more threatening as the half wore on as Fernando Forestieri's attempt deflected wide of the near post and the Italian, signed from Watford, failed to convert when off balance from close range after new man Gary Hooper had flicked Daniel Pudil's delivery in to his path. As the hosts continued to probe, Heaton was left scrambling as Wallace's piledriver from the angle of the area arrowed over the crossbar. However, the England international goalkeeper was able to deal with Forestieri's strike from the edge of the box far more comfortably. Burnley, though, could have increased their lead just minutes before the interval. Arfield won the corner, David Jones delivered and Westwood somehow clawed Vokes's header off the line. After the break, the home side gave the Clarets a taste of their own medicine as they leveled within three minutes of the restart. Jack Hunt hung the ball up for the towering frame of Nuhui, the striker cushioned the pass in to the path of Lee and the midfielder fired the ball between the legs of Heaton to make it 1-1. The volume levels were raised a notch inside Hillsborough and Wednesday continued to push forward. Barry Bannan rifled over the bar after Stephen Ward thwarted Nuhiu with a vital challenge. And Nuhiu headed in to the stands after Lee's effort was diverted wide. At that point Dyche introduced Matthew Taylor at the expense of Boyd and the former Hammer impacted immediately, hooking a volley over the top from the edge of the box. The midfielder showed all his quality and experience moments later with an exceptional 35-yard raking pass that picked out Vokes just yards from goal, but the Welshman failed to apply the necessary touch with just Westwood to beat. As the hosts failed to play through the Clarets they restricted to speculative attempts from distance. Bannan's left-footed volley dipped just over the bar while Heaton was equal to Wallace's shot at his near post. After Rouwen Hennings replaced Gray, Owls stopper Westwood saved low from Arfield as the Irishman punched Joey Barton's set-piece in to the Scotsman's path. German forward Hennings almost made the headlines in stoppage time, but his stinging volley was straight down the throat of Westwood.